Rosy’s appointment scheduling software has features that include double booking, enhanced workflow, managing cancellations, and the ability to access your schedule from anywhere. Rosy knows efficiency is a priority in busy salons and spas. That’s why salon and spa appointment software is so important. 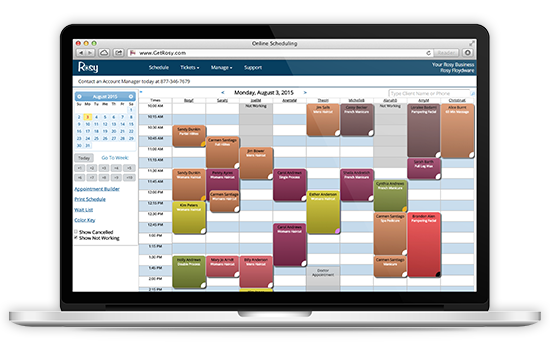 With Rosy, the most comprehensive software in the salon and spa industry, appointment scheduling is effortless. All features are intuitive and easy to use and the list of scheduling features is extensive. It just takes three letters and a few clicks to book appointments, easily work out plans for multiple appointments, access client history, and personalize reminders. All information for any client is immediately available with a click on the appointment screen including contact information, color formulas, personal preferences, and a complete retail/service history. Easy to use, Rosy’s browser-based interface is familiar to web users everywhere. And the average training time is just two hours! This greatly reduces your training costs and time spent implementing a software solution in your salon or spa. It frees up your staff so that they can provide the personal attention that builds client satisfaction and loyalty. You simply won’t find another product that has Rosy’s capabilities and ease of use! It’s the ultimate salon appointment app!